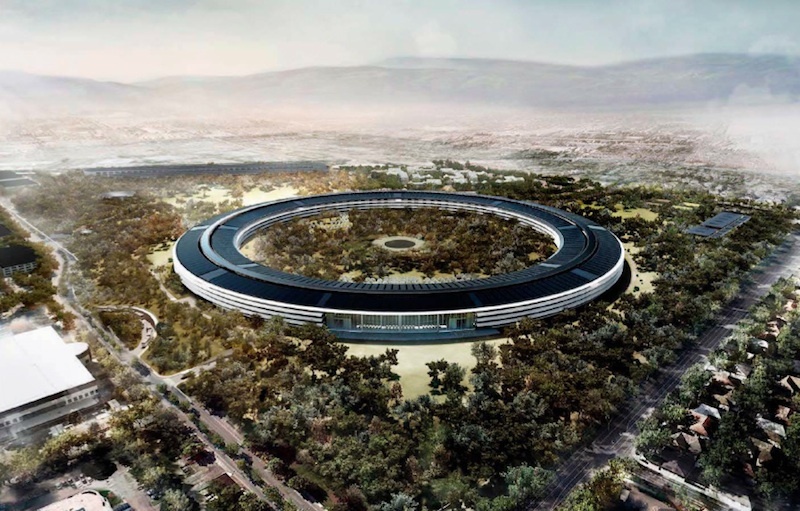 In a lengthy report today, Bloomberg Businessweek takes a look at Apple's upcoming "spaceship" campus in Cupertino, noting that the project is currently one year behind schedule and roughly $2 billion over budget. Since 2011, the budget for Apple’s Campus 2 has ballooned from less than $3 billion to nearly $5 billion, according to five people close to the project who were not authorized to speak on the record. If their consensus estimate is accurate, Apple’s expansion would eclipse the $3.9 billion being spent on the new World Trade Center complex in New York, and the new office space would run more than $1,500 per square foot—three times the cost of many top-of-the-line downtown corporate towers. According to the report, Apple is working to shave $1 billion from the cost of the project before beginning construction. Bloomberg Businessweek pins much of the responsibility for the cost issues on Steve Jobs, whose insistence on design and construction quality as well as unusual and expensive construction methods have defined the project. The true expense of the campus lies not in green tech, though, as much as the materials—as well as what product designers call “fit and finish.” As with Apple’s products, Jobs wanted no seam, gap, or paintbrush stroke showing; every wall, floor, and even ceiling is to be polished to a supernatural smoothness. All of the interior wood was to be harvested from a specific species of maple, and only the finer-quality “heartwood” at the center of the trees would be used, says one person briefed on the plan last year. - 6 square kilometers of curved glass manufactured by Seele in Germany using specialized processes to prevent clouding or distortions. Seele has doubled the size of its production facility to accommodate the project. - Per Jobs' orders, gaps between surfaces should be no more than 1/32 of an inch, far tighter than the typical 1/8 inch standard in U.S. construction. - Polished concrete ceilings are to be cast in molds and then raised into position to ensure uniformity, rather than being cast in place. The requirement "left one person involved in the project speechless." The report notes that investors concerned over Apple's falling stock price and looking for the company to return more cash to shareholders are questioning Apple's commitment to following through on Jobs' vision for the new campus. The company may, however, have little choice in the matter if it seeks to maintain its image as an iconic and visionary company in the post-Jobs era. They have 140 billion on the bank. They can afford it. I hope they stay true to the vision of Jobs. They have the money, why not make something amazing. Steve's dead. Be sane and move on. They should make the pond in the centre the shape of the apple logo. I've gotta be honest, the level of dedication and perfection they put into this should match what they claim to do for products. They have the money, so I say why not. Is it the most efficient way to spend the money? No. But that drive for perfection should really be embodied in every facet of the company if thats the standard you expect, including the building. That's what I like about Apple, the tiny little details that make such a difference. These are the things you have to love about Steve Jobs... He was always strived for perfection. Impressive! Meh. While I admire the attempt to create something great, why bother? I would think most people want their products to be good and could not give a crap about the building. Idea to shave about 4 billion. Make it a normal building. I don't think that you understand the importance of the building - its a symbol of Apple and Steve clearly wanted the building to reflect the products. People don't seem to appreciate just how crazy the tolerances on the iPhone 5 are and how much they must cost to implement, but at the end of the day they make the device what it is. Compare the iPhone 5 and the new BB Z10, they have similar designs but the iPhone 5 is put together in more expensive and complex ways at high tolerance, but the result is a significantly more impressive product. Its the same with buildings. If you are going to spend billions on a new building, you had better do it right. I would probably take a vacation just to marvel at the beauty of the building and campus. Some folks just will not understand that. What is 2 billion more to Apple really?? I would probably take a vacation just to marvel at the beauty of the building and campus. You need a good woman my friend. And both the JR Tolkien estate and several companies in the Jewelry industry are initiating patent lawsuits against Apple for using a ring shape. ;) Edit: I just heard that Trojan and Durex and joining that suit as well. No worries though. In order for the craftsmen to deliver their value in constructing it all, Apple is requiring 30% of their gross receipts right off the top, which should cover about 1/33rd of the next month of LTE data to feed that UUUUUHD Apple television. After that, there's much hope for iPhone 7s, iPad 7 and "something incredible & exciting in the product pipeline" that might actually launch in the next couple of years that is not just another size of an iDevice or a evolved spec of a Mac (something actually new).